Arrive early afternoon to have lunch at our hotel and rest after our long plane ride and trip from Casablanca. We also had dinner at our hotel on the River Bou Regreg. The river separates the twin cities of Salé and Rabat. We then met as a group for introductions. Our guide, Hassan, was from Tangiers. We stayed 2 nights in Rabat. The next morning after breakfast we had an introduction to the Arabic language (28 letters - 8 vowels). When writing in Arabic, it is common to delete the vowel symbols. (When the Koran was written by Mohammed, no vowels were used.) Words are written in horizontal lines from right to left, numerals are written from left to right. Most letters change form depending on whether they appear at the beginning, middle or end of a word, or on their own. And you thought English was hard to learn. Our first destination was to the walled Royal Palace grounds. All we saw was the exterior gate to the Royal Palace and lots of guards. The kings entourage includes palace guards (in red tunics), national police (gray uniforms), royal army (green hat), Islamic officials (in white djellabas), and hand-servants. The grounds were immaculate. A short distance away was the Kasbah des Oudaias and the Andalusian Gardens. The palace was built by Moulay Ismail. The main gate, Almohad Bab Oudaia, was first built in 1159. Outside the wall of the Royal Palace was the ruins and wild gardens of the Berber city, Chellah. Initially it was the remains of an ancient Roman city Sala Colonia. It then became the independent city of Chellah and later became the Merenid's royal burial grounds in the 14th Century. We entered through the Bab ar-Rouah (Gate of the Winds). One interesting aspect was the large number of storks nesting in trees and top of the ruins. They migrate to France for part of the year. We saw the storks as far south as Asni. 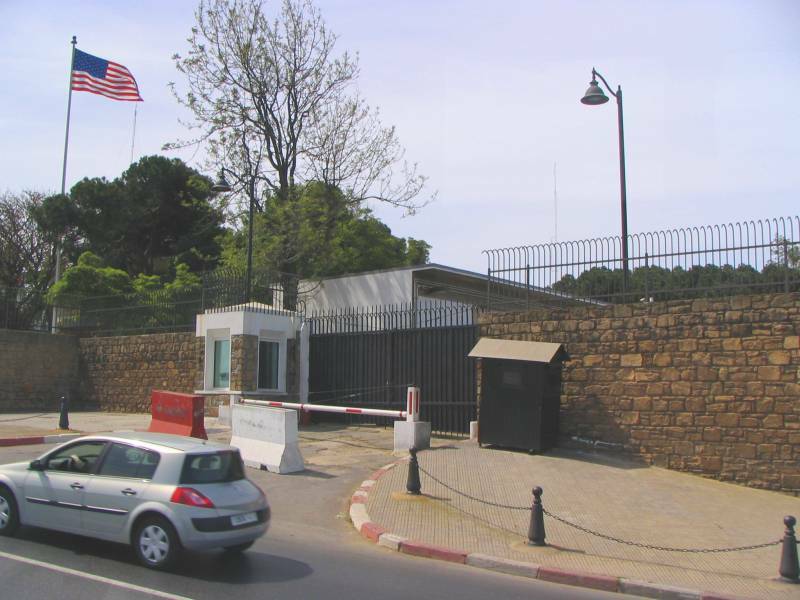 I did get one quick picture of the U.S. compound in Rabat. One of the big attractions in Rabat is the mausoleum of King Mohammed V. There is a small mosque next to the mausoleum. The Tour Hassan is in front of the mausoleum and overlooks the Atlantic. The plans were for The Tour Hassan Mosque to be the largest and highest in the Muslim world. That dream crumbled in the 1775 earthquake which destroyed everything except the pillars and minaret. Back at the hotel a local woman who worked for an American agency gave an interesting talk on the women in Morocco - Islamic customs, school, work, travel, marriage, etc. We could ask any questions - which we did - some very personal. She was gracious enough to answer everything we asked. It made for a better understanding of the "city working woman".